A BLT, smothered in delicious sauce, hot off the pan on a weekend morning (likely after a night of a few shared bottles of wine) is the ultimate breakfast to set you right. 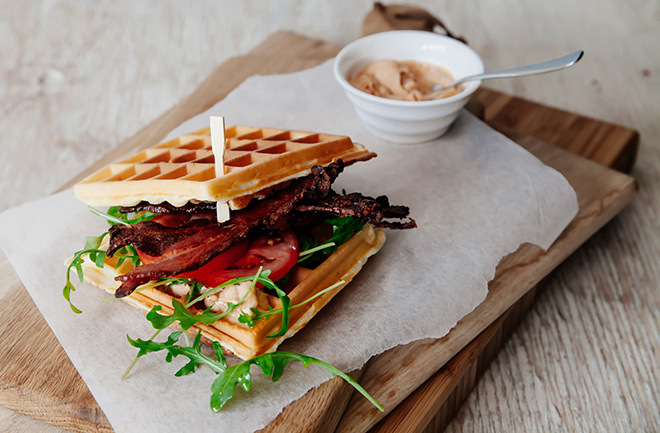 This one ups the stakes a notch by becoming a savoury waffle. It’s something you have to try at least once in your life, but not for the faint hearted. 1. Spray a Belgian waffle iron with some cooking spray if need be and preheat. 2. Pour batter into the waffle iron, being mindful not to overfill. The iron will indicate when the waffles are ready to come out, if not as crispy as you like, leave in for a few more minutes. Continue with the rest of the batter. 3. While the waffles are cooking, get started on your crispy bacon. Preheat a fan assisted oven to 180°C. Arrange slices of streaky bacon onto the rack of a roasting tray. Roast for 15–20 minutes or until crispy. 4. Once all your waffles are done, place them onto a cooling rack. You can reheat them at 200°C for ± 8 minutes if need be. 5. Next mix the mayo and smoked paprika together. 6. 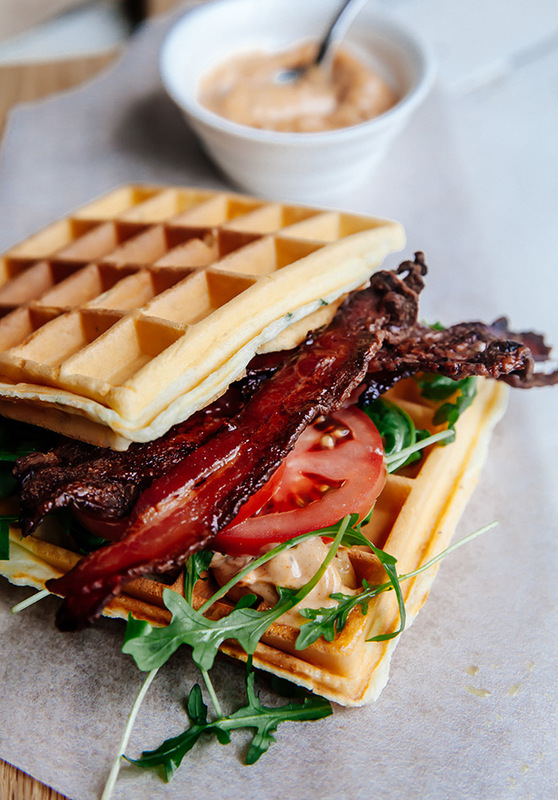 Arrange crispy bacon, rocket, sliced tomato and a dollop of smoked paprika mayo between 2 waffles to create one mean BLT savoury waffle sarmie. 7. Repeat with the rest of the waffles. You should end up with 6 sarmies. Make sure you have some fresh, home brewed coffee to wash these down. Or perhaps a nice pot of steeping tea. If this recipe strikes your fancy, make sure you’re signed up to our newsletters for more of these sent straight to your inbox. Who knows when next you’ll need a recovery breakfast?